In the time it takes you to watch one Vine video, you can do a thorough job of brushing your teeth. 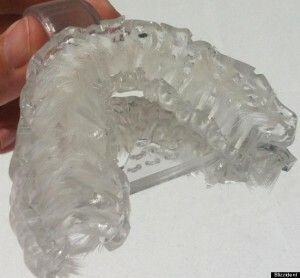 Blizzident, a new 3D-printed toothbrush, looks like a mouthguard lined with 600 bristles. You bite down into the 3D replication of your mouth and grind your teeth on the bristles, which cleans all of your teeth simultaneously. “It was the intention of the designers to make toothbrushing as easy as biting into an apple” Chris Martin, a Blizzident spokesman, told Mashable. The process of ordering one of these custom-fit brushes begins in your dentist’s office. Your dentist takes an impression of your teeth and sends it to Blizzident — and the team gets to work. Printing and manufacturing takes about 12 weeks, Martin said. The brushes are 3D-printed on high-precision machines. Whereas other 3D printers produce objects with rough surfaces, Blizzident’s machines print totally smooth objects. The goal isn’t just to make brushing quick, but to ensure the technique is just as masterful as a dentist’s. “The 6 second brushing time was only a side effect of the method,” Martin said. But your first Blizzident will cost you $300 — a pretty penny more than a typical toothbrush. This does not including payment to your dentist for the impressions. The brush lasts a full year, since the bristles do a lot less work that those of traditional toothbrushes. Customers can replace the brush for $159 or send it back to the company, and for $89, Blizzident replaces the bristles and disinfects the brush. You can place orders online here.